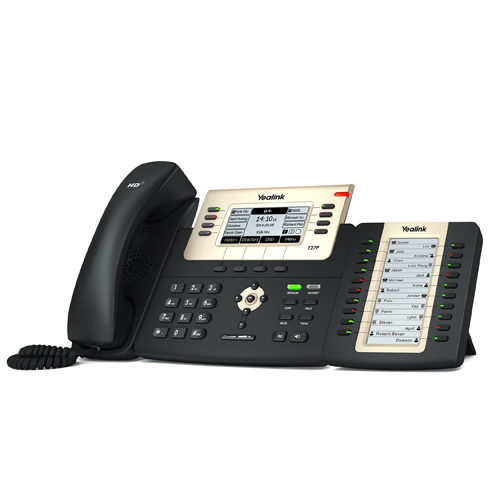 The Yealink EXP20 is the next iteration of the company’s flexible and powerful SIP-T27G/P and SIP-T29G advanced IP phone models. The EXP20 contains a large and user-friendly liquid crystal display (LCD) interface that measures 160x320 pixels, as well as contains 20 physical, dual-color LED keys. The additional screen space and added number of buttons simplifies user navigation and streamlines essential operational functions such as speed dial, BLF, BLA, call forwarding, transfer and hold. Up to six EXP20 phone systems can be strung together on a single daisy chain. The advanced new Yealink EXP20 is an ideal IP phone system for receptionists, administrative assistants or contact center workers who need to monitor and manage a large volume of calls on a regular basis.